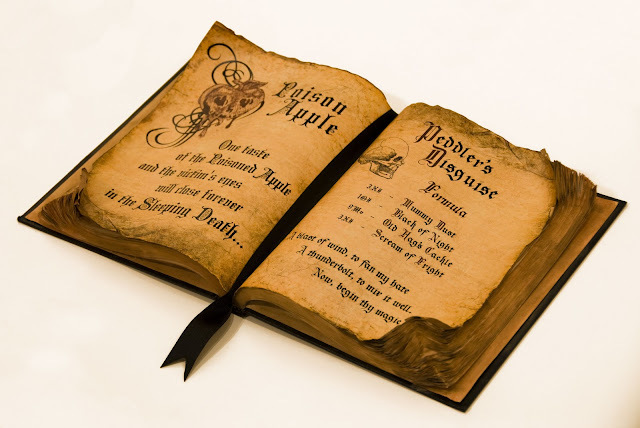 Here's another Halloween project you can make for cheap - your own Spell book! I've been wanting to make one of these since last year and given what my costume is for my Halloween extravaganza at work, this was the perfect opportunity. I was originally going to do the witches' spell from Macbeth, but decided on these two spells because it fits better with my theme. Any guesses on who I'm going to be? I started by making the two spell pages. I designed mine in Photoshop because that is my software of choice. The internet is such a beautiful thing when it comes to finding free stuff. I got the fonts for free from Dafont (my favorite resource for cool fonts). The skull is courtesy of The Graphics Fairy (love, love, love her free clipart) and the apple was from an artist on Deviant Art. Anyway, I bought a book at Goodwill for $2. I brought it home and painted the edges with a reddish-brown watercolor (extra water) and tried to rough it up by curling the edges. I also used another brown acrylic paint to give it some dimension. Then I just roughly cut out the pages I had designed and spray mounted them on, working the edges into the curls. Lastly, I added a bookmark which is just a strip of black ribbon hot glued to the spine on the back. The book is just meant as a display prop, not for people to go flipping through. Otherwise I would have covered the front and hand stained or painted every page, not just the sides. It was kind of fun messing up this book. I can't tell you how many times I've damaged books on accident (reading in the bathtub), but never on purpose! If I were to do another one, I was thinking of a different approach for the pages. Maybe dipping all the pages in coffee or tea and letting it dry out like that? If anybody tries this, let me know what your results were! I love it! I'm definitely going to try this. Great idea! I love it! Are you going to be Maleficent? I want to literally steal your book... I can't get enough of it! It's already on my "next year" Halloween craft list! Thanks for linking up @ SewWoodsy.blogspot.com! Great idea. I love it and may have to "borrow" it. This is such a cool Snow White's witch spell book! Definitely a keeper for Halloweens to come. May have to do this as a Halloween party project for my younger siblings I'm spending the day with this year. Very clever. This has to be one of the most creative Halloween crafts I've ever seen! That's so cool! Love, love, love it! I might have to take a trip into work to see it all! I LOVE this! I have been thinking of making one too, so now you have inspired me to DO it! Yours turned out so great! Wow! This looks like something straight outta a catalog! Great Job! I love it! This is very cool. Thanks for all the links to resources you used as well. That's very thoughtful, for a witch I mean. I love this idea-cheap and fun! This is such a show stopper! What a wonderful idea! I can't wait to make this. It will go perfect with the spooky potion bottles I just finished. Good work, very creative and frugal! This is awesome!! Great job!! Excellent ! I did something similar with my art class a few years back but it was their own fairy tale book....love it ! Thanks for sharing ! I'm featuring this on my blog today! It is really amazing so I hope you don't mind! I featured this on Sew Woodsy today & you also won the CSN gift certificate! Congrats & hope to see you back next week! Congrats on your first Altered Book! Great job, prop or not! I love this! I have been doing the same indoor decorations for several years now (with a few tweaks each year) but I think I am going to use this book as a jumping off point for a new look. Thanks! That is amazing! I'm already really behind on everything that I need to do before our Halloween party but I may have to add this to the list anyway. :) Thanks again for linking up! What a great idea! I have to give this a try next year. While junking at my favorite place (Goodwill) I found a few hard back books with "scary" titles like The First Vitcim, The Coffin Dancer and Black Widower and stacked them on my mantel and other misc Halloween decorations. I was pleased with the results...but your idea is awesome! Thanks for sharing. This is fantastic!!! I definitely want to make one of these... very cool! Thanks for linking this up to Brag Monday. This is just amazing. Love it!!! May I ask what fonts you used?? I adore this soooo much I am going to make a christmas book. I love this. My daughter was just asking for a spell book yesterday. You have come to my rescue. Thank you. Love the Spell Book. 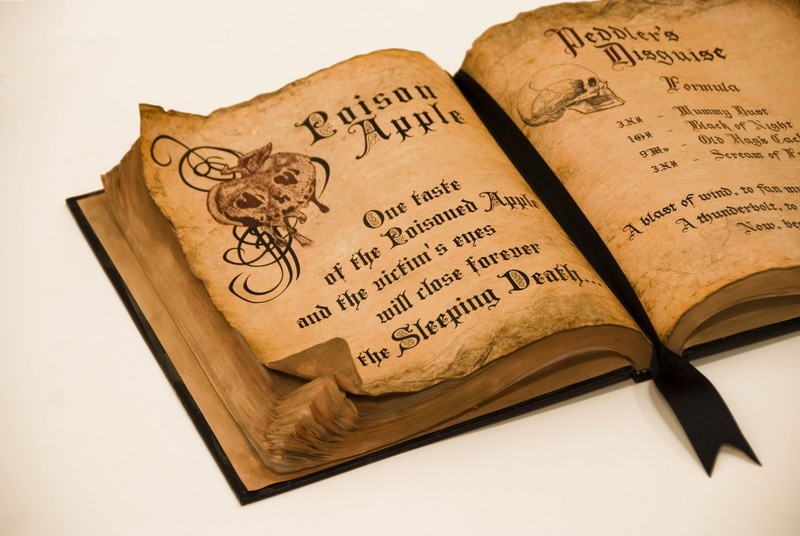 I have a few of my own but refer to them as my Book of Shadows but alas, they cannot be displayed. (sigh) If you try the tea you will have to soak the book edges for about 15-20 minutes. That is called a tea bath. The results you get are incredible & the pages will turn out looking authentic. I did smoething similar years ago for my art piece on hamlet and I used teabags to stain the pages and they naturally curled by themselves and had that perfect mix match color of the pages. If you use regular teabags to get the ligther color and then if you use like a berry teabag it will give it a darkish brown tint. I found you via Craftgawker, this is absolutely amazing! You've done an amazing job. I am going to try this method myself. I'm a new Follower! Fantastic! I can't wait to do this. Thanks for sharing! I love your book! You did such a fantastic job! I would love to have one just like yours!!! Would you consider sharing the pages to be downloaded? You were obviously the evil queen from Snow white. Mine is obviously more Harry Potter themed but i thank you SO MUCH for the idea!! Wow this looks great, Thanks for sharing. This would be cute for a party menu! I think I may make one for my party table food! Would love to know the fonts used. awesome book. thanks! What kind of paper did you print your pages on? This looks amazing! Could you tell me where you got the filigree calligraphy that's behind the apple? Which font did you use from dafont.com? They have so many but I can't find that one, and I absolutely love it!